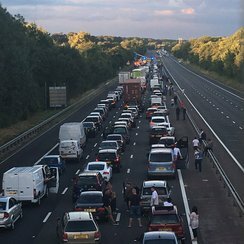 Drivers Stuck on M3 near Basingstoke after road closed for almost 12 hours due to serious crash. Hampshire Police say the single vehicle collision took place on the northbound carriageway at 7.11pm this evening (Friday, July 29). The M3 was closed and people took to twitter warning of the delays as people got out of their cars as the traffic was at a standstill. The road reopened at 6am on saturday morning following the serious road traffic collision between junctions 6 and 7. There is no update yet on how the driver is involved in the colliision.